An eye-opening video produced by the folks at ATTN, lays out how cocaine was banned as a means of social engineering, using racism as the main tool in driving this agenda. The desired results were achieved by utilizing stereotypically false racist attributions, perpetuated in the media as a means of turning public opinion against specific substances. Cannabis was attributed to Hispanics, hence the coining of the term “marijuana,” as a means of correlating the drug with Mexicans immigrants. Cocaine was attributed to blacks while opium was linked to the Chinese, with each being associated with racist depictions relating to use of the drug in question. As hysteria grew, mainly due to the racial demonization of drugs, Congress took action with the passage of the Harrison Act of 1914, which outlawed the production, distribution or importation of opium and cocaine. These actions were then followed up with the outlawing of marijuana on a federal level with the Marihuana Tax Act of 1937. The modern “War on Drugs,” which has been waged disproportionately upon urban minorities, has its roots in the Nixon administration. Nixon dramatically increased the size and presence of federal drug control agencies and pushed through measures such as mandatory sentencing and no-knock warrants. In the early 1980’s the crack cocaine epidemic hit the inner cities of urban America with a vengeance. It began the devastation of black communities and the disenfranchising of many of the socially conscious organizations, such as the Black Panthers, which were working towards ending institutionalized racism. Journalist Gary Webb in his groundbreaking investigative series, Dark Alliance, exposed deep connection between the CIA and large scale drug trafficking, which many attribute to the crack cocaine epidemic. The violence associated with the crack scourge was steadily fed to the living rooms of middle America on the nightly news, which once again manifested as fear in the public. The public then begged the politicians to save them from the media spoon fed menace. Thus began the approach to “get tough on crime,” which can be seen in the disparate penalties for crack cocaine vs. powder cocaine. Crack, which was primarily used by blacks, was given a penalty 100 times more severe than that of powder cocaine, which was primarily used by whites. This sentencing difference was in spite of the drugs being the same pharmacologically speaking. In 2010, the Fair Sentencing Act reduced this disparity down to an 18 times more severe penalty for crack vs. powder cocaine, but a massive difference in the way these almost identical substances are treated remains. It’s quite clear what the impetus for making drugs illegal has historically been, racial fear. 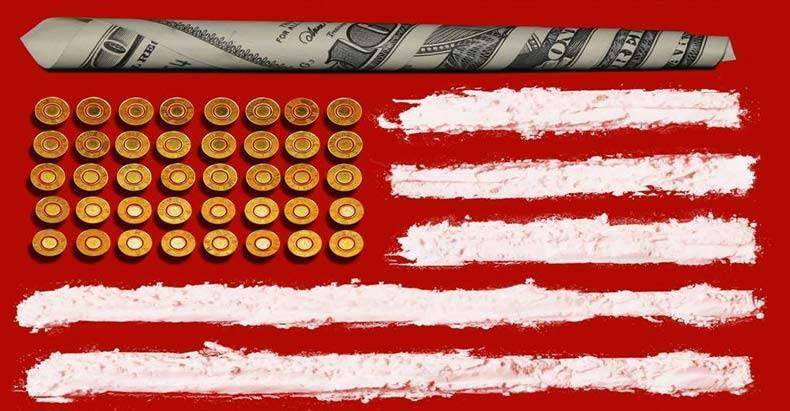 The violence perpetrated upon innocent people under the guise of a “War on Drugs” clearly shows that it’s actually a war being waged on all freedom loving Americans. The manner in which racial prejudice has been used by the state to forward its agenda throughout history is consistent with the divide and conquer approach that continues to be used domestically and abroad, with the mainstream media seemingly ever ready to assist. Jay Syrmopoulos is an investigative journalist, free thinker, researcher, and ardent opponent of authoritarianism. He is currently a graduate student at University of Denver pursuing a masters in Global Affairs. Jay’s work has previously been published on BenSwann.com and WeAreChange.org. You can follow him on Twitter @sirmetropolis, on Facebook at Sir Metropolis and now on tsu.